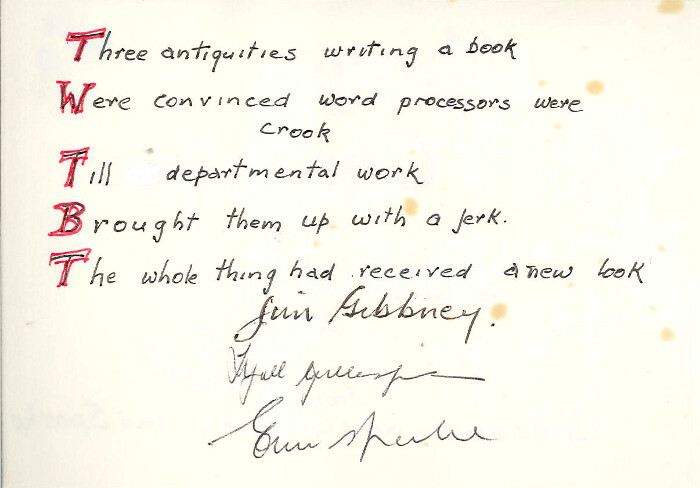 "Three Antiquities Writing a Book"
In addition to providing access to ACT Government records, ArchivesACT also holds a small library of publications, which for the most part, we have inherited over time. 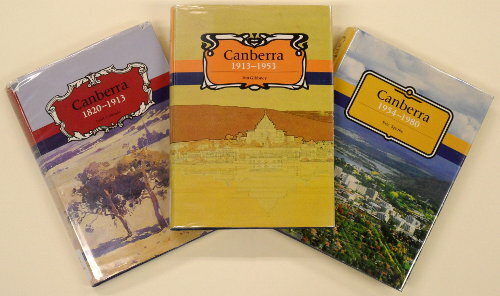 One of these is a three-volume set collectively called 'The History of Canberra' that cover the region's history from 1820 to 1980. Together, they provide a comprehensive history of the Canberra region since European settlement up to 1980. Unfortunately, none has been in print since their first and only run. While opening up one of these volumes recently, not only did it provide the answer to our research needs but also gave us a little treat. Out popped a handmade Christmas card! This card is the ArchivesACT Christmas 2015 Find of the Month. 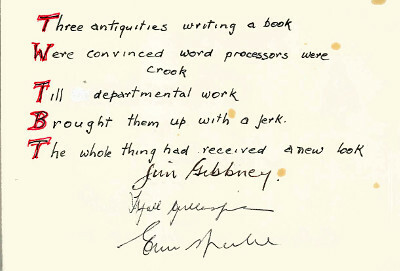 The Christmas card was not the only card inside the Gibbney volume. 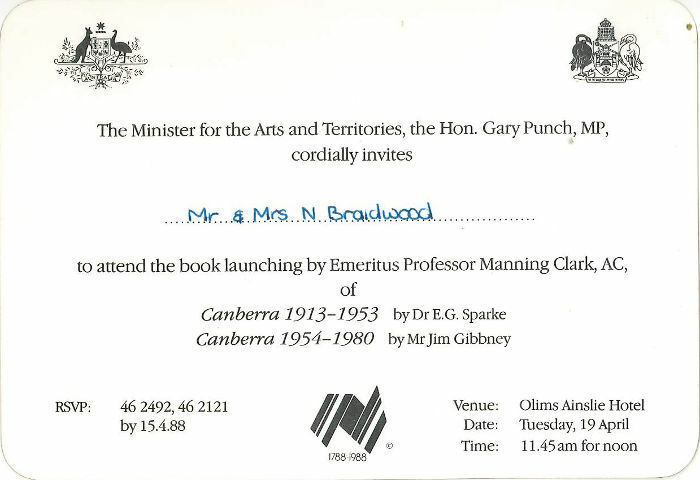 There was also an invitation for Mr and Mrs N. Braidwood to attend the book's launch. The Gillespie volume also contained an invitation for a Mr Neville Braidwood to attend. We now had a name. Neville Braidwood was born in Perth in 1928 to Nelson and Marjorie Braidwood. Following in his father's footsteps, Neville became a journalist. In 1949, he was working for the Maryborough Chronicle in Queensland when he became engaged to Elaine Fitzgerald whom he married in October 1950. After spending time in Perth and Albury, the Braidwood family moved to Canberra in 1962. Neville spent several years as Chief of Staff for the Canberra Times before joining the Department of the Interior in 1968. In December 1969, he was appointed Director of the Department's Information and Public Relations Branch, a position he remained in until his retirement in January 1987. During his time as Director, Neville maintained "an excellent working relationship" with Graham Downie at the Canberra Times, often feeding him stories. 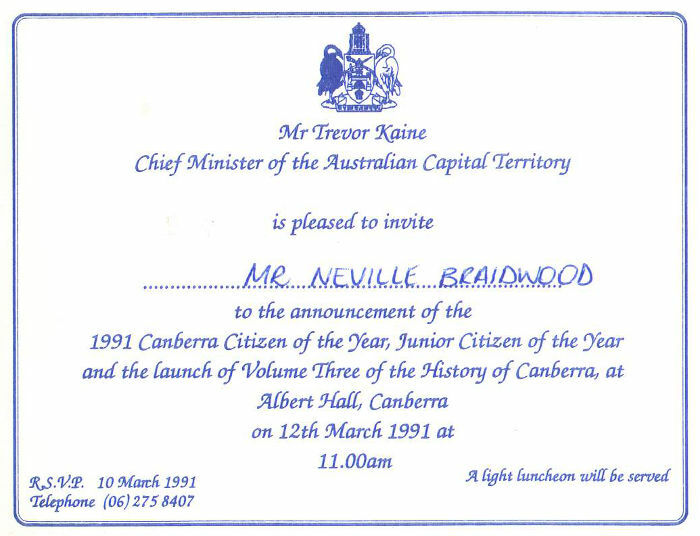 Invitation to the launch of volume one by ACT Chief Minsiter, Trevor Kaine, at the Albert Hall on the 12th of March 1991. It was in his role as Director of Information and Public Relations Branch that Neville and his staff provided support and assistance to the authors of the History of Canberra books. 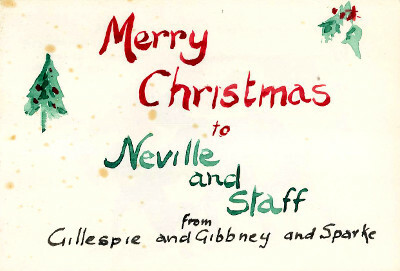 The authors in turn showed their appreciation for Neville's assistance in their signing of the books presented to him and this lovely handmade Christmas card presented to Neville and his staff. After leaving the Public Service, Neville went on to become the Community Relations and Marketing Manager for Koomarri. In 1989, he was instrumental in organising the Koomarri Art Union House Raffle with its major prize being a new house on Outtrim Avenue in Calwell. Neville and Elaine returned to Queensland in the 1990s. Elaine passed away on the 8th of March 2001 and Neville on the 31st of March 2005 aged 77. Neville Braidwood's family kindly donated his personal copies of the History of Canberra volumes to ArchivesACT after his death. "...as a means of acknowledging the 1988 Bicentenary, the Department, through AGPS [Australian Government Publishing Service], publish a detailed history of the development of Canberra from the days of discovery." Biographical detail of prominent people in the district. On the 6th of June 1981, the DCT advertised for authors, gathering 23 responses. "Tenders for authorship, research and related expenses ranged from $22,000 to $150,000 for a single volume history." With an estimated $50,000 to cover publishing costs, the DCT expected the total production costs to be around $200,000. In December 1981, Minister Michael Hodgman, concerned about the cost of project, asked the DCT to explore "alternative ways" in producing the history. By now, the DCT had refined the project to a three-volume set; however, they were unable to find an alternative method of funding. This resulted in the DCT advising the 23 tenders that they were unable to proceed with the project as "the Department has been unable to have (the) project accorded priority and as a result no funds are available..."
Despite this, the DCT did continue to search for alternate funding and in July 1982, former City Manager, Lyall Gillespie came to the rescue. Gillespie, who had recently retired, offered to write volume one "as a gift to the Department." The following month, Director of the Information and Public Relations Branch, Neville Braidwood, suggested a solution, "without special funding arrangements", for the remaining volumes. He noted that one of the 1981 tenders was Frank Brennan, a Senior Legal Officer with the Deputy Crown Solicitor's Office. He suggested an arrangement between the two Departments to allow for the transfer of Mr Brennan to the Information and Public Relations Branch for a period of four years to produce the two volumes.